It was restored in 1973 by a local architect, Anthony Swaine, and was originally a large hall house with a high central area with louvres at the top to let out the smoke from the fires. (The chimneys are later additions). 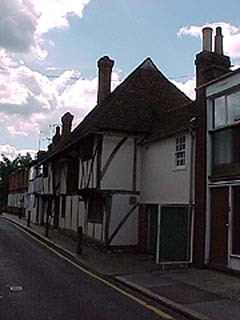 Typical of these hall houses is the central recess, which you can see in the second photo above. Compare this building with Simple Simon's - St. Radigund's Hall, with a similar recess. It used to be a pub in the 17th century. 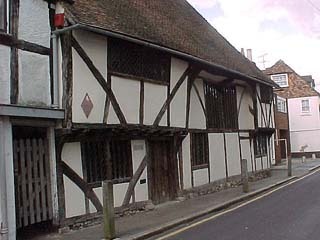 It has two storeys, and is timber-framed with a plaster infill between the timbers. 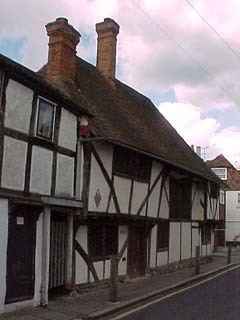 In the 18th century it was refronted. 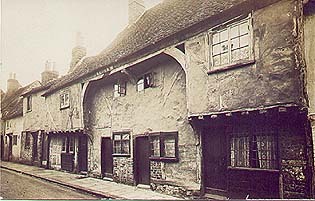 I recently discovered this postcard marked 'from a Canterbury collection' - I am pretty sure it is the Ivy Lane Hall before restoration, because of the building at the end. If you know better, please tell me!